Payette was invited to participate in the U.S. Pavilion at the 2014 International Architecture Biennale in Venice, which opens June 7 and runs through November 23. The US Pavilion will be organized by OfficeUS, which was formed by the Storefront for Art and Architecture and the journal PRAXIS. The U.S. Department of State’s Bureau of Educational and Cultural Affairs supports and manages official U.S. participation at the Venice Architecture Biennale, and the selection of OfficeUS resulted from an open competition. 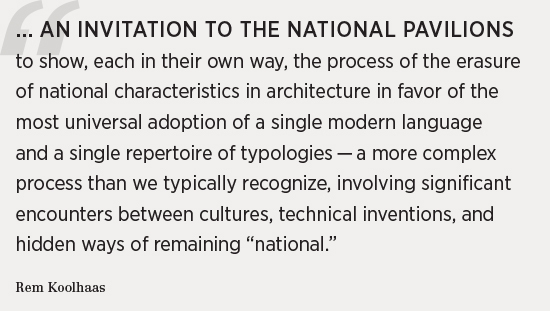 The U.S. Pavilion will be entitled, OfficeUS: Criticism by Re-making. The installation will contain two interrelated components: (1) The Repository: an exhibition archive of 1,000 projects designed in foreign countries by U.S. architecture firms over the past 100 years; (2) The Office: a laboratory of diverse individuals who will critically remake and reinterpret the material in the Repository. Payette submitted projects to The Repository as well a profile of our studio culture for The Office portion of the exhibition.